The US military's Strategic Capabilities Office (SCO) has put out a request for contractors to submit proposals for small nuclear reactors that could be deployed to remote locations that are difficult or dangerous to transport fuel, reports Defense One. Three prototype designs will be funded after a 9-12 month design study phase, while the winning contractor would then build and demonstrate their design for Phase II, according to The Drive. There are a number of potential concepts already in various stages of development that could meet SCO’s requirements. The U.S. Department of Energy’s own Los Alamos National Laboratory (LANL), in cooperation with the Westinghouse power company, has been working on one design called MegaPower for some time now. Westinghouse is separately working on its own eVinci micro reactor design. 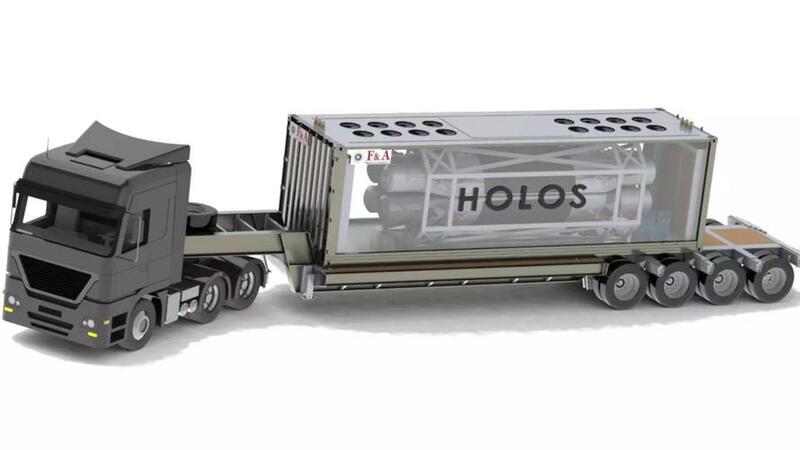 Another design possibility is Filippone and Associates LLC's Holos, which is a gas-cooled modular reactor. Another option in development is Filippone and Associates LLC’s Holos, a unique gas-cooled modular reactor. Named after the Greek word meaning “whole,” the design only “goes critical” and works as intended when a certain number of modules are positioned together, touching off the nuclear reaction. Each self-contained modular has its own turbine generator that then produces power. The Drive also notes other mini nuclear reactors such as the URENCO U-Battery and StarCore's micro reactor - however they note that these are not necessarily meant to be moved around on short notice, and would require significant modifications to satisfy the SCO's portability requirements. In October, the US Army declared in a study that mobile nuclear reactors present "a classic example of disruptive innovation," and that "The return of nuclear power to the Army and DOD will have a significant impact on the Army, our allies, the international community, commercial power industry, and the nation. U.S. nuclear industry growth affects the nation economically and geopolitically. With nuclear industry growth, there is significant potential for generating thousands of jobs… while provid[ing] a deployable, reliable, and sustainable option for reducing petroleum demand and focusing fuel forward to support Combatant Commander (CCDR) priorities and maneuver in multi-domain operations." Meanwhile, Los Alamos and Idaho National Labs have been developing new designs for modular nuclear power according to Defense One. Andy Erickson, Los Alamos's deputy principal associate director of Global Security recently suggested that microreactors could be ready to deploy in "less than five years." The idea to deploy nuclear reactors in the field is not new. In 1954, the Army Corps of Engineers launched the Nuclear Power Program, during which they deployed several types and sizes of nuclear reactors from Alaska to the Panama Canal. While all of them functioned well with no issues, the Army abandoned the project amid the incredibly low cost of oil and an existing infrastructure to supply it. 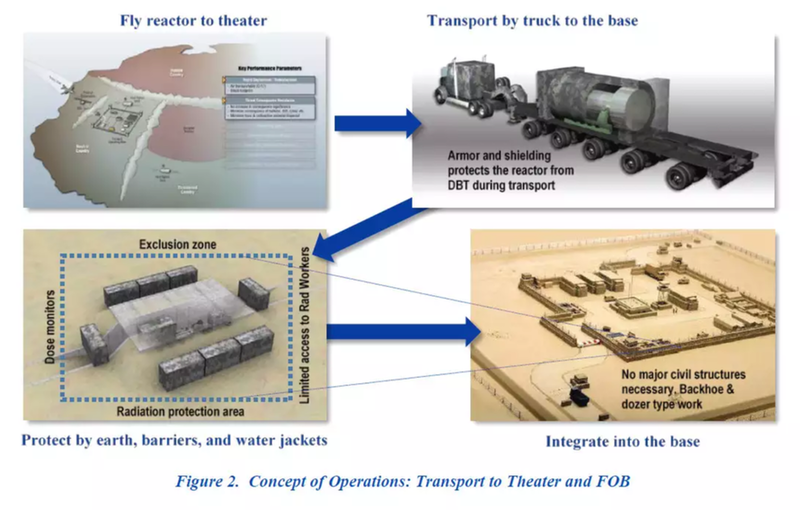 In 2016, a Defense Science Board Study concluded "There is an opportunity for exploration of the use of nuclear energy applications at forward and remote operating bases and expeditionary forces," and that the best approach would be to use radioisotope thermoelectric generators powered by either plutonium-238 or strontium-90. As it decays, the heat generated is converted by thermocouples into electricity. NASA uses such generators to power satellites and other spacecraft, according to Defense One, while the Soviets once deployed the technology in Arctic lighthouses. If the portable nuclear reactor is truly meltdown-proof, it would save the cost and risk of transporting fuel to remote locations. No world on what they plan to do with all the spent fuel.